Vasculitis means that blood vessels are inflamed. When part of your body is inflamed, it swells and is usually uncomfortable or painful (although with many types of vasculitis you will not be able to see any swelling on the outside of the body). The term ‘-itis’ means inflammation, so, for example, when you have appendicitis, your appendix is inflamed; and when you have arthritis, your body joints are inflamed. arteries, which take blood from the heart to various parts of the body – to body organs (like the kidney and liver) and to body tissues (like your skin). capillaries, which are tiny vessels between the arteries and the veins where oxygen and other materials pass from the blood into your tissues. The diagram opposite shows where these blood vessels are in your body (the blood circulation system). Our body organs and tissues need a regular blood supply to work properly. If the blood vessels are inflamed, this can block or reduce the flow of blood. The wall of the blood vessel can also bulge this is known as an aneurysm. An aneurysm can burst (rupture) and cause problems. The diagram on page 3 shows an inflamed blood vessel where the blood flow has been reduced. The blood circulatory system. The ‘small vessels’, which are too small to be recognised by the naked eye, are spread throughout the tissues of the body. The damage which vasculitis can cause depends upon which part of the body is affected - the bigger the blood vessel the greater the potential damage. And the more important the body tissue supplied, the more serious the damage will be. Vasculitis can appear suddenly in someone who has previously been completely well - doctors call this primary vasculitis. Vasculitis can also appear in people who have an established disease such as arthritis - this is called secondary vasculitis. It may happen, for example, with rheumatoid arthritis, systemic lupus, erythematosus (SLE) or Sjörgren’s syndrome (see article for more information on these conditions: ‘Rheumatoid Arthritis’, ‘Lupus’ and ‘Sjögren’s Syndrome’). Vasculitis in large arteries – this includes temporal arthritis and Takayasu arthritis. Vasculitis in medium-sized arteries – this includes polyarteritis nodosa and Kawasaki disease. Medium-sized arteries can also be involved in vasculitis which occurs with (is secondary to) rheumatoid arthritis, systemic lupus erythematous and Sjögren’s syndrome. ‘Vasculitis’ means inflammation of the blood vessels. This diagram shows a normal artery (top) and one which is inflamed (bottom). Vasculitis in small arteries – this includes Wegener’s granulomatosis, microscopic polyangiitis and Churg-Strauss syndrome. Vasculitis in the small arteries can also be a consequence of rheumatic diseases, including rheumatoid arthritis and systemic lupus erythematous. It can happen with infections including hepatitis and, very occasionally, with different types of cancers, including leukemia and lymphomas. Vasculitis in small vessels (usually capillaries) – this usually involves the skin and is also sometimes caused by a reaction to some drugs. The number of new cases in any given year is in the region of five people per 100 000 of the population. Different types of vasculitis affect different age groups. For example, temporal arteritis affects the arteries of the head. This is much more common in people over 50 years old and it is fairly common for it to be associated with a condition called polymyalgia rheumatica (PMR) (see article 'Polymyalgia Rheumatica' (PMR). On the other hand, Henoch Schonlein purpura is an allergic form of vasculitis mainly affecting the skin. This is much more common in children than adults. There is no one cause, and in most cases the cause is unknown. We do know that vasculitis is not directly inherited - but there may be a small inherited component as several cases can occur in the same family. We do know what causes some types of vasculitis. For example, drugs and a variety of infections, particularly those associated with hepatitis, can cause small vessel vasculitis. From the research done up to now, we believe that most forms of vasculitis are a type of autoimmune disease. This means that the body's defence mechanisms are not doing their normal job: fighting infections and keeping us healthy. Instead, these mechanisms attack the blood vessel wall. This causes the inflammation that damages them. What are the tests for vasculitis? Blood tests and other tests can be used for a number of reasons. Blood tests can show if the blood vessels are inflamed. These tests can also measure how the vasculitis is developing so they may be repeated. A full blood count (FBC) is one of the tests which can be useful. It can help your doctor decide whether you have anaemia (lack of haemoglobin, which is needed to make red blood cells) and whether you have normal levels of white blood cells (which fight infections) and platelets (which clot the blood). Another blood test is the erythrocyte sedimentation rate (ESR), which measures how quickly the cells in the blood settle when they are left to stand in a test tube. This can, indirectly, give an idea of how much inflammation there is in the body. The C-reactive protein (CRP) test also gives an indication of inflammation. Blood tests for antineutrophil cytoplasmic antibodies (ANCA) are important in the diagnosis of some types of vasculitis, particularly the condition Wegener’s granulomatosis. Tests can be carried out to see how the affected body organs are working, such as the kidney (urea and electrolytes and urine tests), or liver (liver function tests). X-rays can test whether the chest is involved. Specific blood tests (such as the CKMB enzyme level) can show whether the heart is involved. The heart can also be assessed by a special ultrasound test (known as an echocardio-gram) and an electrical test (the electrocardiogram, or ECG). If your doctor believes that certain organs have been affected but is not sure whether this is due to vasculitis, a biopsy can be done. A biopsy means that a small piece of tissue is removed for examination or testing. This is particularly useful to find out if the kidney, the muscles, or the lungs are involved. An ear, nose and throat (ENT) assessment is sometimes carried out for people with Wegener’s granulomatosis who have ear, nose and throat symptoms. If you are unwell but no specific organs are damaged, then you will sometimes be given an angiogram.This means injecting dye into your arteries so that they show up on an x-ray. This is often done where the abdominal organs such as the kidney and gut are involved. Immunological blood tests can also be very helpful when the diagnosis is uncertain. If you have vasculitis along with other diseases, such as rheumatoid arthritis or systemic lupus erythematosus, then blood tests can be used to assess how active these diseases are. For example, blood tests can measure the level of rheumatoid factor in rheumatoid arthritis. In systemic lupus erythematosus, blood tests can measure levels of complement and antibodies. A rash on the legs is a common symptom with certain types of vasculitis. How can vasulitis be treated? For example, when an important body organ is involved, like the kidney, you will need much more treatment than if you have vasculitis which only affects your skin. The most serious types of vasculitis involve both medium and small arteries. If you have small vessel vasculitis, then you may only need a small dose of steroids to control it, if treatment is needed at all. Other drugs such as sulphones may also help. If you have small vessel vasculitis which only affects the skin, it may be that the only treatment needed is to treat any underlying infection or to remove the drug or food that triggered the vasculitis. an immuno suppressive agent (usually cyclophosphamide). This will suppress the immune system that is attacking the vessels. corticosteroids. These can be taken as tablets (orally) or given by injection (intravenously). Kawasaki disease can be treated effectively with injections of globulin (a type of protein). hepatitis-associated polyarteritis nodosa can be treated with anti-viral treatment and thinning or cleaning of the blood (plasma exchange). If you have vasculitis affecting large vessels, then you will most likely be given corticosteroid tablets. These are very effective for temporal arthritis and Takayasu arthritis. As with all medications, there may sometimes be side effects. Cyclophosphamide, for example, can cause bleeding from the bladder, hair thinning and an increased risk of infection. Because of these risks cyclophosphamide will be discontinued or exchanged for a different immuno suppressive drug, eg. azathioprine, as soon as the vasculitis is controlled. Possible side effects of corticosteroids include weight gain, indigestion, diabetes, thinning of the skin and thinning of the bones (osteoporosis). If high doses of corticosteroids are given, then you will also be given drugs like bisphosphonates to prevent osteoporosis. In some types of vasculitis (e.g. Wegener’s granulomatosis) an infection may trigger a relapse. You may therefore be given anti-bacterial drugs such as cotrimoxazole to protect against this. These drugs can also help to protect against the complications of the stronger immuno suppressive drugs. If you think you may be developing vasculitis you must go to your doctor as soon as possible. As infections, drugs and foods can sometimes cause the problem, try to think back through the previous few weeks for anything unusual you have taken. The doctor will probably arrange blood and urine tests. If you do need treatment then it is very important that you follow the doctor’s instructions carefully. You will not usually need to keep to any particular diet, unless the vasculitis has been triggered by a food. If you start on steroids, you should make sure you do not put on too much extra weight (see below). You should also keep a good supply of tablets to make sure treatment is not interrupted. The suggestions below may be helpful. However it is very important to recognise that vasculitis can vary enormously from one person to the next and from one type of vasculitis to another. You should therefore ask your doctor or another member of the health care team about any new symptoms or anything you are unsure about. A healthy, balanced diet is important for everyone, but if you are on steroids it is particularly important because these can increase appetite and cause weight gain. Cut down on the amount of fatty and sugary foods you have. Instead, eat more fibre, fresh fruit and vegetables, whole grain bread, cereals, rice and pasta. Steroids can also make osteoporosis (thin bones) more likely, so it is important to get enough calcium. Foods which are good sources of calcium are tinned sardines (including bones), skimmed milk, yogurt and certain vegetables such as broccoli. (See articles ‘Diet and Arthritis’ and ‘Osteoporosis’). Vasculitis can cause tiredness. It is important to recognise this and to allow yourself to rest. However, you should also try to keep muscles and joints healthy by exercising. Do what you feel you can do, starting, if necessary with a very small amount of exercise and increasing slowly. Include weight-bearing exercise (such as walking) but you may also find that swimming is an enjoyable way of exercising. Ask your doctor for advice on how much exercise you should do. Avoid smoking. It makes blood vessels constrict (become narrower inside) and therefore can make vasculitis symptoms worse. Wearing warm clothes, including warm socks and gloves, helps keep the blood vessels dilated (wider open) by keeping the body warmer. If your fingers feel cold and turn blue, this may be Raynaud’s phenomenon. Ask your doctor about this. (More information is given in article Raynaud’s phenomenon). Your doctor or specialist nurse may be able to give you ideas on other ways to help yourself, or recommend a self-help or support group for vasculitis and other forms of arthritis. In the past, some types of vasculitis were very serious diseases, especially if the small and medium-sized arteries were affected together. Treatment over the last two decades has completely altered this – most forms of vasculitis can be controlled and sometimes completely cured. The new problem to be faced is that some treatments have unpleasant side-effects – some are almost as damaging as the disease itself, but in different ways. New research is looking at treatments which will be better than the present ones. Studies with anti-cytosine drugs (a form of immune treatment) such as infliximab or etanercept may help patients with certain types of vasculitis, including Wegener’s granulomatosis and Takayasu’s arthritis. Treatment with intravenous proteins (called immunoglobulins or gamma globulins) can also help now. The use of less toxic drugs eg. methotrexate, mycophenolate mofetil (among others) in the maintenence phase reduces treatment side effects. Researchers are also trying to understand better what causes vasculitis. Comparing what happens in different countries may help to find the answer. Classical polyarteritis nodosa is more common in southern Europe than northern Europe. If differences such as those mentioned can be understood, this will help researchers develop better treatments. What are the specific types of vasculitis? This affects the main artery from the heart and its large branches, usually in younger women. The major arteries narrow and this reduces the blood supply to the limbs and other parts of the body. However, the narrowing develops slowly and the arteries do not usually block completely. As a result, there is rarely a dangerous loss of blood supply to the arms or legs or any major organs. This arteritis usually responds to steroid treatment quite quickly. This affects the large arteries which supply the head and neck especially the temporal artery (over the temple), hence the name. It is much more common in people over the age of 50 or 60 and is more common in northern Europe. As many as ten people per 100,000 can develop temporal arthritis each year in the over 60’s (that is, new cases). It frequently causes headaches. 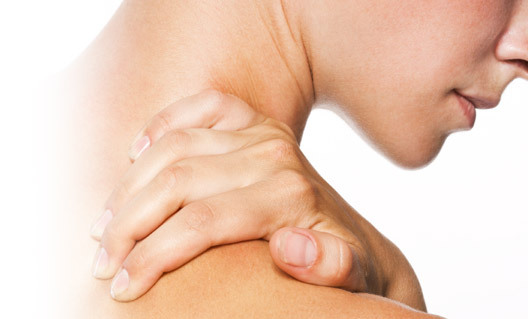 The muscles are often inflamed and stiff in the shoulders and hips (this is polymyalgia rheumatica (PMR) – see our article, ‘Polymyalgia Rheumatica’). It occasionally involves the blood supply to the eye where it can cause blindness. Happily, this risk is very much reduced by steroids. However, if your have this condition and you have any problems with your eyes such as blurring or double vision, you should report this to your doctor immediately. Try to eat a healthy, balanced diet and avoid putting on extra weight. This condition is now known as classic polyarteritis nodosa to distinguish it from microscopic polyangiitis. 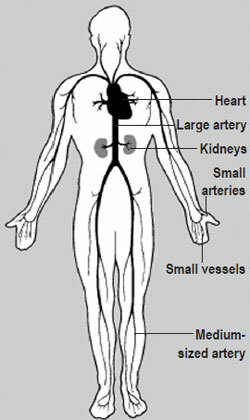 The medium sized arteries are inflamed, particularly those supplying the gut and kidneys. This may only affect part of the wall of the artery, which becomes weak and may bulge, forming an aneurysm. If it bursts it can cause serious internal bleeding. Alternatively, it can involve the whole wall of the artery at a particular point, which causes a blockage. This serious disease is fortunately rare – only about five new patients per million of the population develop it per year. Kawasaki disease was first described in Japan in the 1960s. It affects small and medium-sized arteries in young children. It is also sometimes called mucocu-taneous lymph node syndrome (because it involves the mucous membrane and skin rash which is similar to measles). These children often feel generally unwell - they have a high temperature, swollen glands in their neck (lymphadenopathy), and an inflamed area around the eye (conjunctivitis) and the mouth. Although relatively rare, this can be serious if the arteries supplying the heart are inflamed. Up to 60% of patients with Kawasaki disease have this problem (coronary arteritis). Aneurysms can be detected with a special ultrasound technique and angiography. Fortunately, the inflammation often settles with treatment but a few children can die if the aneurysms burst. This is relatively rare - it affects approximately ten people per million per year and is slightly more common in men than in women. It usually develops with ear, nose and throat problems, including nose bleeds and crusting of the nose and occasionally coughing up blood (haemoptysis). These symptoms can appear a year or two before a more general vasculitis starts. This general vasculitis usually involves the skin, lungs, eye and kidney. Some people with this disease have kidney problems: if Wegener’s granulomatosis is not recognised early, this may lead to kidney failure which will need dialysis. Blood tests can help to show if the kidney is involved and a new test known as ANCA is often used. Some patients have bleeding from the lung which causes the coughing of blood mentioned above. At one time, Wegener’s granulomatosis was a fatal disease. Nowadays, treatment is very effective, especially with a drug called cyclophosphamide. In most patients this can induce long-term remission which can last for many years. Sometimes anti-bacterial drugs such as co-trimoxazole (Bactrim). Oxazole may be given to people with this condition to protect against infections which could trigger a relapse. Churg and Strauss were two American pathologists who described this condition. In it, asthma develops in adult life and then inflamed blood vessels are caused by swellings (called granulomas). There will also usually be a high number of eosinophils (a particular type of white cell) in the blood. This is different from Wegener’s granulomatosis because of the allergic history (particularly asthma). There is rarely any damage to the ears and nose. Churg-Strauss syndrome more often affects the nerves, which causes weakness or pins-and-needles/numbness. There is also a higher risk of the heart being involved, which it is important for the medical team to recognise using blood tests and electrical tests (electrocardiogram (ECG) and echocardiogram). If the heart is involved, this usually means high numbers of eosinophils, which can occasionally cause damage (necrosis) to the heart muscle similar to that seen in a heart attack. Any suggestion the heart may be involved therefore means that treatment should be given as early as possible. Headaches can be caused by temporal arteritis. It is most often kidney specialists who diagnose this - almost all people with this condition have kidney involvement and can develop kidney failure. Patients usually complain that ‘they are always tired’ - this is because of anaemia. Blood tests will show that the kidney is inflamed. The first signs of an inflamed kidney can be spotted by special tests of the urine which usually show the presence of blood and/or protein. Because the kidney can also be involved in Churg-Strauss syndrome and Wegener’s granulomatosis, patients must have regular urine samples checked for blood and protein when all these diseases are considered. Microscopic polyangiitis can also involve the lungs, with bleeding which can cause anaemia and breathlessness. sometimes, a mild form of arthritis which does not last very long and, only occasionally, abdominal pains which cause blood in the stools. This type of vasculitis is usually self-limiting. 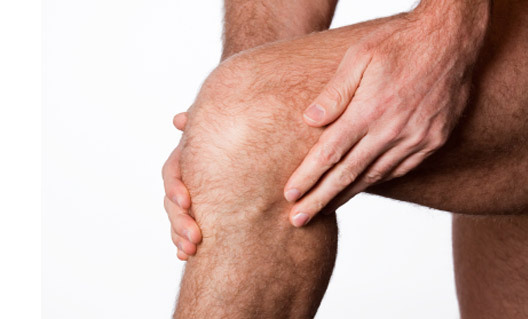 It does not normally cause serious damage to either the joints, kidneys, skin or bowel. Just occasionally, and perhaps more frequently in adults, there can be more serious damage to the kidney which leads to kidney failure. Your doctor will be careful to watch for any signs of this. In this disease, small vessel vasculitis is associated with cryoglobulins – these are specific proteins which stick together in the cold, causing problems. This is an important disease to recognise because too many cryoglobulins can create ‘sludging’ in blood vessels which can block them. Cryoglobulins can be removed from the blood by a mechanism called plasmapheresis (plasma exchange).